In her opening remarks, she said the petrol subsidy removal was to safeguard the future of Nigeria and her children. According to her, if Nigeria did not take the measures, the country would be forced to experience such hardship “that would frustrate the future of our children and we will be like some countries like Greece which kept on borrowing until they got to the crisis situation that they have found themselves”. Okonjo-Iweala said that if Nigeria continued to borrow to run government, then crisis was imminent and the best thing was to begin to arrest the situation. The minister asked Nigerians to understand that withdrawal of oil subsidy was just one aspect of deregulation of the industry. This exercise (fuel subsidy removal) will help in creating about 370,000 jobs and this will help the problem of unemployment. to put our roads in better shape and therefore reduce transport fares. The railways will also benefit and this will further reduce costs. The trains are generally cheaper means of transportation and something will be done in this respect. Nigeria is one of the worst cases in maternal health care. Nigerian women record deaths in maternal cases more than many other countries and this sector will benefit from the money that will accrue from this withdrawal. I understand the pains Nigerians are going through. I personally do and so do other colleagues of mine. We plead for patience. The impact of this will begin to show soon. We intend to start publishing the amount we are saving from this withdrawal of oil subsidy monthly and also where we are directing them. Nigerians will be participants in this process. In few months prices will begin to come down depending on market forces. Okonjo-Iweala, who is also the Coordinating Minister on the Economy, added: “It was never to my knowledge that the president gave such a date (April 2012). There is no particular time one could say was best suited for the withdrawal. It is the prerogative of the president. The important thing is that we cannot carry on the way we did in the past. It would be plunging our future into crisis.” With these words, Finance Minister, Dr Ngozi Okonjo-Iweala, dismissed the claim that the Federal Government reneged on the promise to remove the subsidy on petrol in April 2012 as against January 1 when it did. 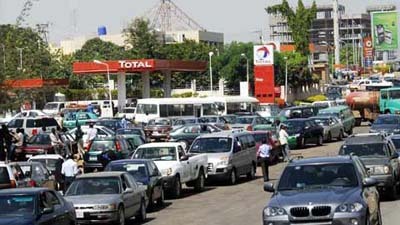 The whole world is watching as Nigeria descended into chaos and uncertainty due to the removal of fuel subsidy. The social fabric of the society appears to be shifting and things are no longer at ease as protesters gathered steam and momentum. The brinkmanship between the presidency and labour is something to be given the deserving attention. Was the subsidy removal justified or ill-timed compounded with poor strategizing? It depends on who was answering the question, the government and the poor masses have different perspectives and justifications. Financial Times of London reported that, “Goodluck Jonathan, Nigeria’s president, faces a growing backlash to his sudden removal of a fuel subsidy programme, seen as one of the few contributions the government of Africa’s biggest oil and gas producer makes to its people’s wellbeing. Amid a chorus of criticism from opposition leaders, thousands of protesters staged a second day of demonstrations across Africa’s most populous nation after petrol prices more than doubled overnight." No matter how wonderful things the removal of fuel subsidy will bring to the people as President Jonathan and his economic team promised, Nigerians are not buying it. People are protesting and refuse to settle for the subsidy removal. The Nigerian leadership we can see by now did not sell it well to the people nor convince them of the incoming goodies that will supposedly follow through. It will not take a rocket scientist to figure out why the people do not accept the fuel subsidy removal but rejected the offer of empty appeasement. First and foremost, it is difficult to hold an abiding conversation and agreement with a hungry person. The reality is that seventy percent of Nigerians live in poverty and etched a miserable living with less than $2 a day. With hyper unemployment and ravaging poverty, the nominal benefit that Nigerians can point to coming from the huge petroleum deposit as an oil producing country is the fuel subsidy. "In a New Year's Day announcement, Nigeria's government said it would scrap a 38-year-old subsidy that had kept motor fuel priced at just 65 naira a liter, or $1.55 a gallon. Gas prices more than doubled throughout the country on Monday and continued to inch up to about 140 naira a liter in Lagos, the commercial capital, on Wednesday. Economists warn that the jump in fuel prices is almost certain to push up prices for food and household items in the country of 167 million people, 70% of whom live on $2 a day or less. Inflation has topped 10% in all but two of the past 40 months," Wall Street Journal reported. From any angle one chooses to look at it, most Nigerians do not trust their government. Their lack of trust and disappointment with Nigerian government was not developed on a hallow ground. Prior to this many Nigerian governments have disappointed their citizens for a long time. Therefore it will be difficult for any administration no matter how honest or sincere it maybe to convince Nigerians otherwise. President Jonathan and his economic team did not lay down the necessary steps to carry their people with them. To tell Nigerian people the importance of the removal of fuel subsidy will not compel them to accept the short-time suffering and discomfort that will come from the subsidy removal. The economic wellbeing of the country at the moment is neither encouraging nor warrant such a new hike in petrol price. The majority of the people in the country is relatively poor and desperately relies on the affordable petrol and kerosene. The moderately decent transport fare for survival is going up tremendously. When the people survived with less than $2 daily and a gallon of petrol stood at $4 and rising; how is it possible for the poor to survive together with higher food prices and transportation? Poor strategizing was a major problem to Jonathan Administration and his economic team. The was paucity of strategic planning without soft cushion for the public. There was no trust between the people and the ruling class, for the administration foremost pre-subsidy removal goal would be to establish a comfort level and rapport with the Nigeria people. The government could not actualize a quantifiable trust that it can count on before it the desired action. Nigeria may need to remove fuel subsidies inorder to deregulate upstream drilling. By so doing will result in the attraction of deep-pocket investors into upstream drilling and that will subsequently lower the price of petroleum products including petrol and kerosene. The problem is that it will take a reasonable long time for all these undertakings and Nigerian public may not have the stomach to wait for such an extended time. Nigerians do not buy into the process that they promised that the outcome will be favourable to them due to lack of confidence they have for the government. The government does not have a good track on keeping its promise; therefore there is nothing for the people to build upon. The house of Nigeria has fallen and the people are not ready to pickup the rabbles. The timing for the government’s action maybe its greatest vulnerability; while the government is already battling the major headache coming from Boko Haram, now it will compound the challenges coming from the country's Labour Union and other restless organizations together with the hyper-energetic youths. That is too much load to be carried by this administration that has not strengthen its feet on the ground. Speaking to CNN, Feyi Fawehinmi, an accountant and analyst, said "When you have so much poverty, a lot of business and lives have been built on petrol being at N65, which is not exactly cheap, even at subsidized rates. People are just not moving out of poverty quickly in Nigeria. There is an economic case but this is not something that can be quantified economically, the government cannot tell how many businesses will be ruined or even how many people will die," Fawehinmi continued. "The impact will be so wide-ranging. There should have been a plan to remove this in a sensible way, not in this crude manner." Wall Street Journal stated that "President Goodluck Jonathan is unlikely to yield. Nigeria had been spending about 1.2 trillion naira ($7.5 billion) a year to maintain the price—money that came directly from its oil earnings, never entered the federal budget and could have been better used, his aides have argued, for infrastructure improvements on roads and power plants." That is not good news for although the subsidy has been expensive but at same time the people needs the subsidies to make their lives little less depressing. There is no way out of this one for it looks like the administration is not going to back down nor is the people willing to let go. Nigeria needs peace and stability to continue with its economic growth and implementation of other less troubling economic reforms including restricting of the surging inflation and provision of infrastructures. But when everything comes to a halt because of fuel subsidy removal everybody will be a loser. The economic growth will stop, inflation will soar and investors will recall their capitals. There is still time to find solution in the light before it turns to corpulent darkness. Subsidy on premium motor spirit (PMS) – or petrol, as it is known in the streets – is finally gone. Nigerians got an unusual New Year present yesterday as the price of petrol went from N65 to N143.56, with the Federal Government claiming it could no longer be Father Christmas. After decades of heated debates, the Petroleum Products Pricing Regulatory Agency (PPPRA) finally announced the formal commencement of full deregulation of the downstream oil and gas sector effective from Sunday. With a total of 6,000 petrochemical items in the various by-products of refining crude oil, deregulation is expected to drive up investment in local refineries to launch Nigeria into an industrial revolution.Although PPPRA did not disclose the actual price at which PMS would be sold in the wake of the deregulation policy, the fundamental data on daily spot markets obtained from its website suggest that with the summation of petroleum landing cost of N128.07 and N13.20 margins in addition to other charges, the expected price of petrol would be in the region of N143.56 per litre. But the mega stations operated by the Nigerian National Petroleum Corporation (NNPC) were selling at N138 yesterday, while prices varied from city to city. PPPRA, the agency saddled with the responsibility of ensuring petroleum products availability, moderate price volatility and regulates activities of operators in the downstream petroleum sector by establishing parameters and codes of conduct for all operators in the downstream petroleum sector, announced the subsidy removal in a statement that was signed by its Executive Secretary, Mr. Reginald Stanley. Stanley said the agency was acting in accordance with its statutory mandate as enshrined in Section 7 of the PPPRA Act, 2004. He called on petroleum marketers to take note of the fact that no subsidy would be paid on PMS discharges after January 1, 2012. “Following extensive consultation with stakeholders across the nation, the Petroleum Products Pricing Regulatory Agency (PPPRA) wishes to inform all stakeholders of the commencement of formal removal of subsidy on Premium Motor Spirit (PMS), in accordance with the powers conferred on the agency by the law establishing it, in compliance with Section 7 of PPPRA Act, 2004. By this announcement, the downstream sub-sector of the petroleum industry is hereby deregulated for PMS. Service providers in the sector are now to procure products and sell same in accordance with the indicative benchmark price to be published fortnightly and posted on the PPPRA website,” Stanley said. While declaring that service providers were henceforth expected to procure petroleum products and sell same in accordance with the indicative benchmark price which would be published every fortnight in the website of PPPRA, Stanley assured consumers of adequate supply of products at prices that are competitive and non-exploitative. “Petroleum products marketers are to note that no one will be paid subsidy on PMS discharges after 1st of January 2012. Consumers are assured of adequate supply of quality products at prices that are competitive and non-exploitative and so there is no need for anyone to engage in panic buying or product hoarding,” he said. He noted that there was no need for Nigerians to engage in panic buying or hoarding of petroleum products as a result of this development. According to him, the Department of Petroleum Resources (DPR) is mandated to protect the interests of consumers in terms of availability of quality of product in the country. “The PPPRA in conjunction with the Department of Petroleum Resources (DPR) will ensure that consumers are not taken advantage of in any form or in any way. The DPR will ensure that the interest of the consumer in terms of quality of products is guaranteed at all times and in line with international best practice,” he added. But the Chairman and Chief Executive Officer of Capital Oil and Gas Limited, Mr. Ifeanyi Ubah, said PPPRA should stop publishing the benchmark price and allow the market forces to drive the price of fuel. Ubah stated that the publication of price by the PPPRA shows that the sector is not yet fully deregulated and urged the agency to allow competition to drive the price. Welcoming the removal yesterday, the Executive Secretary of Major Oil Marketers Association of Nigeria (MOMAN), Mr. Obafemi Olawore, urged all stakeholders to support the action. “We should no longer debate whether the removal is good or not. It is good for Nigerians and we will do our best to support it. What we should be concerned with is to task government for judicious utilisation of the proceeds. The press should hold government responsible and monitor how the money that will be saved will be utilised,” he said. Meanwhile, the cost of locally refined petrol has been put at N61.18k per litre, excluding profit, distribution and marketing margins. This is contrary to the claims on social media that it costs N35 per litre. In a cost/pricing analysis of refining Bonny Light volunteered by Mr. Paul Obanua, a Director of Earthnergy Petroleum and Gas Limited, a prospective investor in a refinery in Delta State, the cost of the PMS component in one litre of crude oil is N44.28k. Quoting Energy Information Administration (EIA), Obanua also stated that the cost of refining one litre of PMS is N16.90k, bringing the total cost of one litre refined locally to N61.18k. “However, when the refiner adds a profit margin of 30 cents, translating to N48, the refiner’s cost will come up to N109.18k. This is what a refinery will sell one litre of locally refined PMS in Nigeria,” he said. He noted that after buying from the local refineries, the fuel marketers could add the market/distribution margin of 20 cents or N32, quoted internationally by EIA or N15.49k recommended by the PPPRA, bringing the retail price to N141 or N124.67k. Enumerating the benefits of local refining, Obanua, who is also the National Coordinator of Mass Interest Project, stated that power, petrochemical and steel are the three industries that lead to industrial revolution since the 20th century. Economists, policy makers and economic observers know that fuel subsidies as being implemented in Nigeria since 1970s is not sustainable. But one thing that policy makers and stake holders including the executive and legislative arms of the government together with the bureaucrats and technocrats must comprehend is that the weaning out from the milk and honey of fuel subsidies must not come to abrupt termination without comprehensive strategy. There must be confidence building steps the government must initiate and implement, thereby preparing the poor masses before the removal of the fuel subsidies. Without doubt the monetary cost of the fuel subsidies are enormous and no fiscally responsible government can allow that to continue. But if we can be honest to our selves, Nigeria is a special case. The level of poverty and deprivation are humongous in Nigeria and this quantifiable abject poverty with shameful numeric indices can be a threat to democracy and nation building. Seventy percent of Nigerians survived with less than one to two dollars daily according to World Bank statistics and two third of Nigerians cannot boast of three square and balanced meals daily. Under this climate of penury and massive poverty; citizenry economic inadequacy culminated by drastic depravity of day-to-day resources for survival must be put into consideration. Therefore the quick and immediate withdrawal of a social net that the poor found solace will be a big blow. Nigeria has been described as a nation rich in oil and natural resources but the majority of the compatriots have never really drink from golden cup of the black gold –oil. Many things that many countries take for granted are lacking and missing in Nigeria. There is constant darkness in the country due to paucity of electricity, there is no sufficient supply of drinking water and boreholes together with ‘pure water’ sachets have replaced the normal and expected tap water. Afterward the ‘pure water’ sachets are littered every nooks and corners of the country. There is no adequate housing especially in the urban areas. The poor transportation facilities with visible pot holes that populated the few drivable roads are health hazards and brought about the unnecessary road accidents. The health facilities are not accessible to the poor masses and diseases that can be easily treated are killing children and senior citizens. The only thing that most Nigerians can point as a show of the country’s oil wealth is affordable fuel including petrol and kerosene. The price of kerosene is affordable to mothers due to the subsidies. Now can the government in all its wisdom go ahead and interrupt such a program without first make another provision to the suffering masses? In democratic nation the power reside with people and the masses voted the politicians into power and authority. The government elites and leaders should seek the ear of the people and listen to their voice before making any consequential decision. The policy makers and political leaders cannot afford to speak to one another and turn around and make this drastic decision for the stake is too high. The voices of the people are not in synchronizing to the removal of fuel subsidies. Although the Federal Government of Nigeria pledges to increase the budget by 7 percent to off set the ramification of the removal. According to Nigerian government the removal “will free up about 1.2 trillion naira in savings, part of which can be deployed into providing safety nets for poor segments of society to ameliorate the effects of the subsidy removal." But an average Nigerian probably will not believe that his government could re-investment in the people without obstruction by the roaring corruption. It is the truth that Nigeria must rein in spending by having a sensible budget that must be prudently implemented. The monetary policy cannot do the trick of holding down inflation and promoting sound economic management with the presence of incoherent fiscal policy. Nigeria must do the right thing for the economy but at same time the government will not become fiscally sound by balancing the budget on the back of the poor people. The people are desperately poor and without social nets for their welfare, wellbeing and safety nets the polity may drastically deteriorated to uncertainty. The only fuel subsidy that allow poor women and mothers to buy kerosene at affordable price for their families cannot be taken away without acknowledging that the poor masses have nothing else to do or turn to. That will be a great injustice and the weakening of the social contract with the populace. The softening of the social fabric of the country can be stopped from further hemorrhage when people’s welfare becomes the utmost quest and highest ideal in the polity. Nothing is amiss with economic reforms and oil liberalization but it must come with human face and dignity to the poor. The masses too have the responsibility of recognizing that the fuel subsidies cannot last for ever and they must begin to see that the privilege is not a right, and subsidy is not a sacred cow that is untouchable. Even the subsidized Kerosene for a while has been so scarce that citizens have to line up in a long line for a litre of kerosene. Kerosene continued to be rationed in some parts of the country. At a point in time fuel subsidy will be definitely removed but the immediate removal will have untold suffering to the poor masses. Nigerian policy makers should construct a comprehensive framework pathway in order to justify the removal of the fuel subsidies. First and foremost a responsible timetable should be established stipulating the incremental frequency and steps to accomplish the targeted goal. Take for instance, five years maybe timetable allotted for the final removal of the fuel subsidies. In the first year 20 percent of the subsidy may be removed and that will proceed incrementally until the whole subsidies are completely removed. By this methodology the government will diminish and escape the ‘shock and awe’ operation associated with the immediate removal. Another aspect of the comprehensive procedure for the removal of subsidy is the needed ‘cause and effect’ operation. By this the money extracted from the incremental removal will be invested variably on the much needed social and health infrastructures that people desperately needed. The money from the subsidies will be invested in building maternity clinics to cut down on infant mortality, deaths associated with childbirths and provision of drinkable water to eradicate deadly water borne diseases. The government may gradually remove subsidy progressively - one year after another. The government may particularly remove petrol subsidy but allow kerosene subsidy to stay put. Why? The removal of kerosene subsidy will affect almost all Nigerian poor including women and children. There is sociological-economic implication of removal of fuel subsidies that must be taken into consideration. More or less inflation is the bane of economic growth in Nigeria, despite its recent slowing down with the aggressive application of the tightening of the monetary policy. The removal of subsidy without doubt will spike inflation higher in the short run except when a deliberate and comprehensive framework is set in motion to rein in inflationary trends. The transportation industry will be adversely affected with higher price of petrol. They will pass down the burden and cost to the consumers. The prices of food and consumer items will go high and so is inflation. The scenario of the government pledging to increase its budget by 7 percent may not be effective. This will not do any good to anybody for the spending increase will not trickle down to the poor. Nigeria has never really gone after its way to stimulate the disposal income of its poor and do not have the infrastructures do that even if she wants to. The increase in the budget becomes a threat to the integrity of the economy by triggering inflation. That will not be good news to Central Bank of Nigeria (CBN) that has been lately enjoying some success in keeping inflation below 10 percent. The déjà vu of 1980s of IMF structural adjustment is gradually creeping into the present polity, as government technocrats and bureaucrats are prescribing the neo-liberal policies including monetary tightening policy and cutting of social programs targeted to the poor. They are talking about the budget restrictions, the removal of fuel subsidies and even the devaluation of naira when oil price falls. Nigerians recognized that over spending, over borrowing and wastefulness must be restrained, controlled and restricted. But we must also acknowledge that inspite of all the economic theories of sound management; Nigeria has a sizeable majority of her people that live in poverty and massive depravity. These people must be attended to; therefore the mopping of liquidity and removal of fuel subsidies must not have preference over human suffering.